A European group that monitors internet censorship tweeted Tuesday that 85 percent of Venezuela was offline. 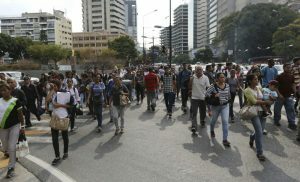 CARACAS, Venezuela — Venezuelans reacted with despair and resourcefulness on Tuesday as nationwide power cuts closed schools and businesses, paralyzing a nation that was only starting to recover from its worst blackouts earlier this month. The new outages, which began Monday, forced people to follow now-familiar routines: scour neighborhoods for food in the few shops that were open or seek out the few spots where they could find a signal on their mobile phones and get in touch with family and friends. The collapse of the power grid was yet another setback for a country whose oil reserves made it one of Latin America’s wealthiest decades ago. Communications Minister Jorge Rodriguez posted a video of a fireman training a hose on smoking equipment at a power facility, seeking to reinforce his claims that Venezuela is under attack by “terrorists” executing a U.S.-led scheme to sow chaos. The government’s allegations aren’t credible in part because it said the military had deployed to protect the entire power grid after the last blackouts, Guaido said. Jose Aguilar, an expert on the Venezuelan electrical grid, said images of a blaze shared by the government as well as information from engineers on the ground indicate the fire began inside one of three critical transformers near the Guri dam, which provides most of the country’s electricity. He attributed the blaze to neglect, saying equipment that facilitates an electrical current’s passage was not regularly maintained. “That calm, you have to be worried about it,” Taioli said. The new outage appeared to have affected the majority of the 23 states in Venezuela, whose steep economic decline contributed to the flight of more than 3 million people, or one-tenth of the population, to other countries as the crisis escalated. Guaido says Maduro’s re-election last year was rigged, and the U.S. has imposed sanctions on Venezuela in an attempt to force the Russia-backed president from power. The country’s main airport at Maiquetia said its emergency generator was operating and that international flights were on schedule. Many international airlines have stopped flying to Venezuela in recent years. Debit cards are a common form of payment in Venezuela, where cash is scarce and hyperinflation hit several years ago. Without power, the cards weren’t working on Tuesday. So some shops that were open gave meat and dairy products to customers in hopes of getting paid later, since the goods won’t last without refrigeration. Shopkeeper Jose Ferreira, 59, said he’d rather give to a stranger and hope for payment later than lose everything. “There are still honest people in this country,” he said.